This is an article I originally wrote for my own newsletter, which was then published in the Brain Gym® Journal, both titled "Refining Lazy 8s." This is the version I included in my book, Educate Your Brain1. In a conversation with Paul Dennison, I learned some very important information about Lazy 8s, one of our most frequently used Brain Gym® movements. First, just what is Lazy 8s? 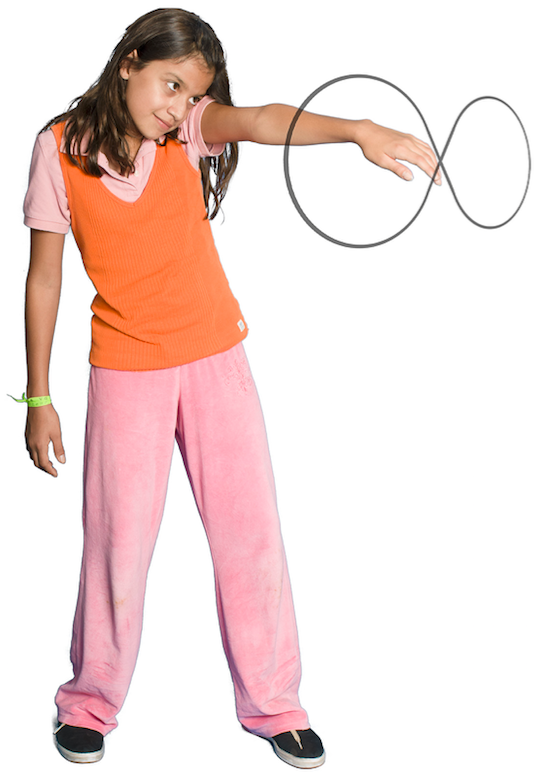 The Lazy 8s movement is done by tracing a lateral 8, or “infinity” sign, over and over, sweeping across the lateral midline of the body again and again, activating both brain hemispheres and encouraging them to work together. 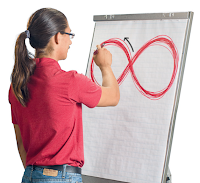 The Lazy 8s movement looks so very simple, yet many people find over time that reading and writing are easier after doing Lazy 8s for just a few minutes, even reducing or eliminating letter-writing reversals. 8 is directly in line with your midline. ability to follow the flow of the Lazy 8; more importantly, notice any areas of resistance, as these will illumine areas where your brain is experiencing “glitches” in how your two brain hemispheres work together, or how your eyes and hand work together. As you continue to use Lazy 8s, it will become much easier, and you will likely find certain aspects of reading and writing easier as well. For a long time, we encouraged learners to trace the Lazy 8 pattern only in the “up the middle” pattern. Any learner who was inclined to trace “down the middle” was gently guided in the “up the middle” pattern. For some learners, this was quite a challenge and resulted in more than a bit of frustration. Paul Dennison now recommends allowing learners to trace Lazy 8s in whichever direction they are most inclined, especially at first. 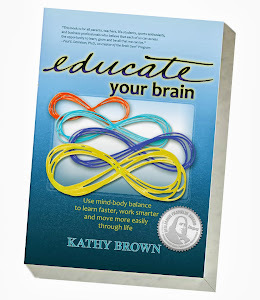 He says that learners inclined to trace Lazy 8s “down the middle” are helping themselves to experience their body more fully, to feel more grounded. Once learners are able to more fully experience their body this way, they will easily make the transition to the “up the middle” pattern. So—the new Lazy 8s guideline is this: Allow learners to trace Lazy 8s in whichever direction they are inclined, at least at first. Regularly model the “up the middle” pattern; invite learners to notice which direction their body feels like flowing, while encouraging eventual movement to the “up the middle” pattern. This guideline can also be used with The Elephant, which is essentially a whole-body Lazy 8; however, the original “up the middle” pattern is always used when doing Alphabet 8s, which rely on that flow for correct letter formation. In fact, Paul Dennison states that the Alphabet 8s and letter formation should not be attempted until the learner has integrated Lazy 8s in both directions, up and down. No matter which form of 8s the learner is doing, it is still optimal to start at the center and move first to the left, so he or she is activating the “ease” aspect of the gestalt hemisphere. I have been playing with this new information and have had very interesting experiences. When I trace Lazy 8s “down the middle” I’m much more aware of my body — my feet even feel more connected to the floor. Then, when I trace “up the middle,” I’m less aware of my body and very aware of my mind — I can almost feel the hemispheres of my brain switching on! I love this new information, because it helps me understand why learners might be inclined to trace Lazy 8s the way they do! Now my job is simply to notice direction of flow the learner is using, continue modeling the “up the middle” flow, and notice change as it occurs (sharing with the learner, as appropriate) with appreciation for the process. Brown, Kathy. Educate Your Brain. Phoenix: Balance Point Publishing LLC. 2012. 112-115. ©Copyright 2017 Kathy Brown. All rights reserved.